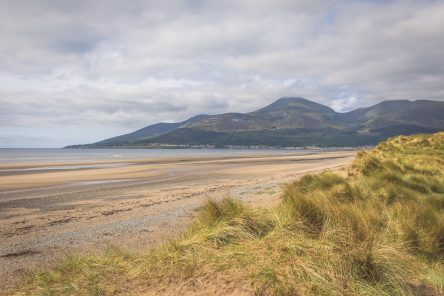 View of the beach and Mourne Mountains from Murlough National Nature Reserve, County Down. Visitors on the beach at Portstewart Strand, County Londonderry, Northern Ireland. 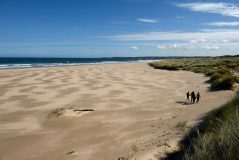 Sweeping along the edge of the North Coast, this two-mile stretch of golden sand is one of Northern Ireland’s finest beaches. 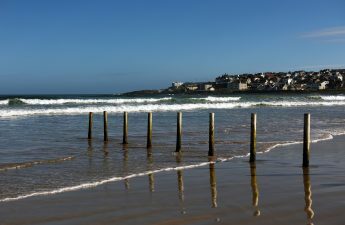 The beach at Portstewart Strand, County Londonderry, Northern Ireland. Sweeping along the edge of the North Coast, this two-mile stretch of golden sand is one of Northern Ireland’s finest beaches. Murlough Beach in County Down, Portstewart Strand and Downhill Beach in County Derry~Londonderry and Port Ban Beach, Dunree, County Donegal will join over 30 beaches across the UK and Ireland on Sunday 11 November for Pages of the Sea, Danny Boyle’s commission for 14-18 NOW to mark the centenary of Armistice Day. The day will finish on Downhill Beach with a large 30m square portrait of First World War Nurse, Rachel Ferguson being completed at 2pm. Rachel was the daughter of John Stewart Ferguson and Annie Ferguson, of Lanebrooke House, Moneymore, County Derry. She died on 26th June 1918 at Bordighera, Italy whilst working for Queen Alexandra’s Imperial Military Nursing Service. She is buried in Bordighera British Cemetery, Italy. Free car parking is available on Downhill Beach with free admission to Downhill Demesne and Mussenden Temple. 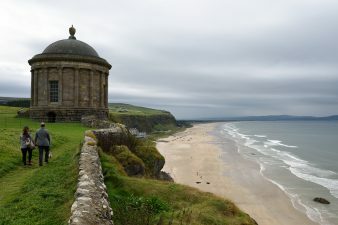 A shuttle bus service will run every 15 minutes, from Downhill Beach to the Lion’s Gate at Downhill Demesne, just a ten minute walk from Mussenden Temple. Poet Carol Ann Duffy has been invited by Boyle to write a new poem, which will be read by individuals, families and communities as they gather on the beaches on 11 November. Copies of the poem are available online and will be available at the beaches for those who wish to come together or to offer their own personal contribution.